Unclean water, inadequate sanitation and poor hygiene practices are directly linked to undernutrition in children through three main routes: diarrhea, intestinal parasites and environmental enteric dysfunction. For example, each episode of diarrhea increases the risk of stunting by 4%. Disinfection of water and provision of soap for hygiene have also demonstrated a relative effect on the promotion of growth (height / age) in children under 5 years of age. Furthermore, investing in integrated actions during the early years of a child's life has multiple ripple effects in terms of reduction of public health costs, strengthening of human and economic capital, hence positively impacting the development of a country. 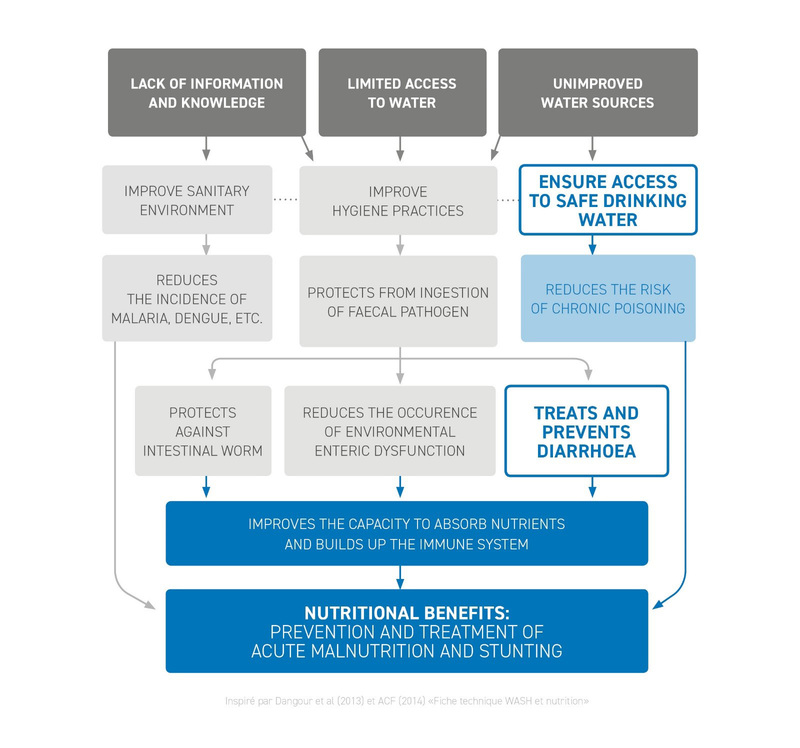 For Nutriset, effective and sustainable nutritional outcomes require coordinated multi-sectoral interventions, between nutrition and other sectors, such as WASH (Water, Sanitation and Hygiene). The WASH'Nutrition approach primarily aims at completing the homebased treatment or nutritional support for malnourished children by promoting practical solutions to access safe drinking water. Many organizations, both donor and humanitarian, have already modeled this integrated approach. For example, Action Against Hunger (ACF) promoted its Wash'Nutrition Guidebook during World Water Week in 2017 and advocates for its Baby WASH and the 1000 days ​​approach to help reduce chronic malnutrition; USAID's initiative is also noted with the WASHplus Supportive Environments for Healthy Communities project. Solutions for an integrated WASH'NUTRITION approach should facilitate access to affordable, high-quality water purification products, essential medicines for diarrhoea, and nutritional solutions to prevent and treat malnutrition amongst vulnerable populations, including children and pregnant and lactating women. As part of its commitment to the SDGs, Nutriset is working to establish strategic alliances and propose WASH'NUTRITION practical solutions to support UN agencies, governments, NGOs and community-based organizations. Through this approach, in line with its mandate, Nutriset aims to strengthen the impact of nutrition programs, improving responses to the immediate and underlying causes of undernutrition through a more integrated and comprehensive method, fully integrating communities and promoting nutritional autonomy for all.